The first of two Canadian printings of the Avon paperback edition of People of Darkness, originally published in 1980. 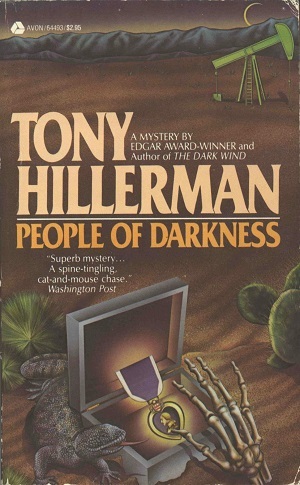 The fourth book in Hillerman's Navajo Mystery Series, People of Darkness is the first novel featuring the protagonist Sergeant Jim Chee of the Navajo Police. The cover design is not credited but it features a desert scene with an oil pumpjack, lizard, cacti, and a skeletal hand reaching towards an open box with a purple heart medal inside. Format: Paperback, 17.5 x 11 cm.